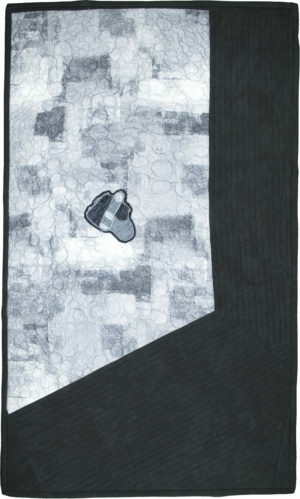 The iconic NASA photo of Snoopy (LEM) returning to Charlie Brown (Command Module) was the basis of this quilt. In May 1969, the Apollo 10 mission encompassed all aspects of an actual crewed lunar landing, except the landing. It was the first flight of a complete, crewed Apollo spacecraft to operate around the moon. To make sure that the crew of Apollo X didn’t decide to land the LEM (and be the first ones down), it was not fully fueled. So they were watched very closely. The moonscape was created using Texture Magic under a layer of batting and the background fabric. I chose the background fabric because of its mottled texture. I thought it reflected the colors and light of the moon. With my free motion quilting and the heat to activate the Texture Magic, the craters were created. I wanted to create the window frame, as well, and so I use a Cherrywood fabric that had the texture and light to create that feel. Texture Magic under a layer of batting and the background fabric created the moon surface. With my free motion quilting and the heat to activate the Texture Magic, the craters were created. Batik, hand dyed cotton, regular quilting cotton.